All fourteen monumental episodes from South Park’s tenth season are now available in this exclusive three-disc collector’s set. Join the boys as they witness the death of their beloved Chef, band together to defeat a virtual villain who is out to destroy the world and wrestle with the disturbing consequences of seeing the Prophet of the Muslim people on a popular cartoon. For them, it’s all part of growing up in South Park. Now that we have Season 10 on DVD, South Park is almost up to date. I doubt they’ll ever catch up totally unless/until the show ends, so since Season 10’s DVD set emerges in the middle of 2007’s Season 11, this is close enough! This DVD release gives us all 14 episodes from 2006. I’ll examine each of these programs in the way presented on the DVDs, which also is the order in which they were first broadcast. The synopses come straight from the DVD’s liner notes. 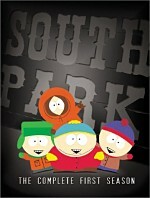 Some episodes of South Park work best when you know about the series’ outside drama. That’s definitely the case with “Return”, since if you don’t know about the controversy related to Isaac Hayes’ departure from the show, it loses much of its appeal. It acts as an attempt to poke fun at Hayes and his devotion to Scientology. In that regard, it only sporadically succeeds. The funniest moments come during the first few minutes just because the Chef dialogue is cobbled together in such an intentionally clumsy way that it really amuses – and I mean really, as I laughed harder at that than anything I’ve seen in a while. Unfortunately, once we get Chef’s kiddie-molesting lines and the pedophiles of the Super Adventure Club, the show loses steam. The perverted gags are predictable and not very good, so they sap the episode of the energy it boasted at the start. A few more laughs emerge, but the thinly veiled slam on the Scientologists – which South Park already did – causes “Return” to falter. At least the ending almost redeems this otherwise disappointing episode. Funny – recently the Washington Post has featured a debate on “Prius politics”, and “Smug” highlights that issue. This is the kind of thing South Park does best, as it pokes holes in the self-righteous among us. The best moments come when Kyle’s family goes to San Francisco, a bastion of pious behavior. Other aspects of the program offer a delightfully nasty take on self-appointed do-gooders. 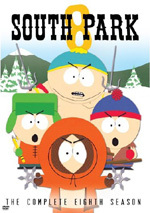 There’s some hypocrisy on display, as South Park often likes to smell its own farts, too, but I still like the program. When a series runs a two-part episode, I prefer to save my comments until I get to its conclusion. So look for my thoughts down there! “Wars” pokes fun at itself to a degree, but – more importantly – it slams Family Guy. How that show has earned an audience escapes me, as it features mostly cheap, obvious gags or nonsensical pop culture references that exist for no reason other than to seem clever. Cartman usually follows wrong-headed paths, but in his single-minded hatred for Family Guy, he’s right on the money for once. It also lampoons the idiocy that surrounded the whole Mohammed cartoon hubbub a few years ago. “Wars” probably belabors its points – which the series often does – but still gets in enough laughs to succeed. I always thought Towelie was a borderline character, but his use here works really well. The concept of a towel’s autobiography – and his impersonation of a human to make this fly – is damned goofy, and the side plot that involves talking parts of Oprah’s anatomy proves surprisingly successful. It’s an odd episode, as the South Park residents don’t pop up at any point; it’s all Towelie, all the time. It becomes weird even for South Park, but it’s pretty good. I don’t think series head honchos Matt Parker and Trey Stone don’t like to openly state their political affiliations, but theories that they’re pretty conservative receive a lot of support from this season. First “Cartoon Wars” makes George Bush look like a reasonable, intelligent person, and then this one paints Al Gore as a moronic, sensationalistic Chicken Little. Look, Gore can be a self-aggrandizing blowhard, but I think this episode lashes out at his cause without much logic. And it’s just not a funny one, which is the bigger problem; I might’ve chuckled a couple times, but I don’t think much amusement pops up here. Cartman-centered shows usually work well, and this one has a number of good moments. Anytime we get to see Cartman’s worst behavior, the program becomes more amusing. “TSST” portrays Cartman in a funny light, especially when he plots to kill his mother. (It’s funnier than that sounds.) The show actually scores some surprisingly subtle – for South Park - points about how parents create bad kids. Am I the only one who thinks “Love” feels more like a commercial for World of Warcraft than an actual episode? The series already had fun with the kids portrayed as anime characters, so this one comes across as a rehash of that. Some funny moments result anyway, but the show’s a disappointment. Only South Park could connect someone pooping in an elementary school urinal with 9/11. The parts with “The Hardly Boys” fall flat, mostly because they do little more than shoot for some lame, obvious gay jokes. Still, I like the way the show mocks conspiracy nuts, so it manages to succeed overall. I kept waiting for “Boy” to really go somewhere, but it never did. Cartman’s take on the whole bounty hunter thing was surprisingly ineffective, and the that parts with Ike were pretty lame. I know the show wanted to make a point with the double standard whereby adult man/young girl is sick but adult woman/young boy is admirable, but things never percolated. Season 10 limps on with another mediocre episode. Like so many of its brethren, this one displays the superficial qualities that make the series work, but the gags just don’t register much of the time. “Hell” usually becomes pretty predictable and stale, though attempts to get the ghost of Biggie Smalls to LA for the party entertain. If nothing else, “Go” amuses due to Garrison’s hilarious “explanation” of evolution. Cartman’s desperate attempt to survive the wait for the Wii also entertained. I like the fact that when Cartman finds himself stuck 500 years in the future, he doesn’t care that everyone he knows is dead; he’s only upset that he still can’t get a Wii. Some downs emerge, but overall this turns into a good program. I’ll give the folks at South Park this: they took the simple concept of an impatient kid and turned it into something radically different. We began with Cartman’s desire for a Wii and ended up in a future society of warring atheists. I do like the fact that even faced with all the advances achieved over 500 years, all Cartman cares about is playing with the Wii. We get a pretty good parody of cheesy sci-fi TV shows in this goofy but good show. Season 10 ends on a good note with “Cup”. The program embraces a mix of clichés to become entertaining as it parodies sports movies. While it doesn’t fully redeem Season 10, it’s one of the year’s better shows – with an ending that seems super-dark even for this series. South Park has always been an up and down series, but Season 10 seems more “down” than usual. While prior seasons manage to produce at least three or four great episodes, I can’t find anything here that qualifies as better than “pretty good”. 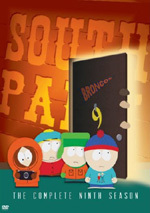 South Park: The Complete Tenth Season appears in an aspect ratio of approximately 1.33:1 on these single-sided, double-layered DVDs; due to those dimensions, the image has not been enhanced for 16X9 televisions. I found the material here to greatly resemble episodes in recent seasons. Which was fine with me, as the shows looked quite good. Very few issues affected sharpness. As usual, some minor bouts of jaggies and shimmering cropped up, but these weren’t an issue. The episodes consistently displayed good definition and delineation. Source flaws remained absent, as I noticed no specks, marks or other problems. The series stayed with a basic palette that the DVDs replicated well. The colors looked lively and dynamic through the 14 episodes. Blacks were dark and dense, while shadows looked appropriately smooth and clear. I felt pleased with the visual quality of these shows. Another sense of déjà vu came when I examined the Dolby Surround 2.0 audio of South Park. As in the past, the soundfields stayed fairly limited. Music showed good stereo imaging, and some environmental information on the sides added a bit to the experience. These elements were terribly involving, but they gave us a decent sense of place. Surround material remained insignificant. Only a few episodes featured notable use of the back speakers, with the most information heard during the “smug storm” in “Smug Alert”. Otherwise I didn’t detect much activity in the back channels. Audio quality was more than acceptable. Speech sounded natural and concise, with no edginess or other problems. Music seemed lively and full most of the time, and effects were also reasonably broad and dynamic. Though the soundtrack never threatened to become impressive, it satisfied. In terms of extras, the set stays consistent with prior packages. We get a bunch of the usual “mini-commentaries”. These accompany all 14 episodes as we hear from creators Matt Stone and Trey Parker. These begin after the credits for each show and last a total of 51 minutes and 56 seconds. The shortest runs two minutes, 19 seconds (“Manbearpig”) while the longest (“The Return of Chef”) goes for four minutes, 55 seconds. Matt and Trey cover the usual variety of subjects. In general, they chat about various stories, ideas and inspiration. In terms of specifics, they discuss how the series was in the news and how it affected the show. We learn of issues with Comedy Central and controversies over Chef, Mohammed and Family Guy and even get some technical specs like working with Blizzard for the World of Warcraft animation. As usual, Matt and Trey prove entertaining and frank. They give us honest appraisals of the topics – yes, they tell us how they really feel about Family Guy - and they’re willing to tell us when they think they goofed. I can’t say I agree with them; they love some episodes I didn’t like, and they think the Towelie show – my fave for this year – was a clunker. I appreciate that they give us their reasons, though, especially when they discuss the “hat on the hat” problems with “Fibers”. I’ve enjoyed all the prior mini-commentaries, so these continue to delight. In addition, DVD One presents some Previews. We get promos for The Best of Chappelle’s Show, Drawn Together, Reno 911!, and Mind of Mencia. Under “Comedy Central Quickies”, we also get clips from The Colbert Report, The Sarah Silverman Program, Mind of Mencia and South Park. These are simply snippets from various episodes. 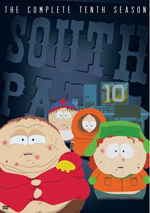 Although I expect a certain level of inconsistency from South Park, Season 10 seems less inspired than usual. We find a few pretty solid shows but none that really soar, and some duds emerge as well. The DVD set provides the usual very good picture, decent audio and interesting mini-commentaries. I’m sure big fans will want Season 10, but I don’t think it’s one of the series’ better years.